Wrap front top is gathered at left side. Three views: A is a halter, B is short sleeve top, C is below elbow length sleeve top. Pattern recommends cotton knits, matte jersey and interlock. I have a thing for halters right now. 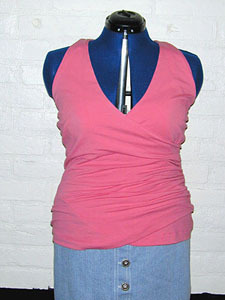 I love the shaping of this top and feel comfortable although the low-cut is unusual for me. It is perfect for a beach party! Fabric used: Interlock with 70 denier lining. My next version of this top will be 11oz rayon which will feel dressier. The interlock was too thick to use for both the bodice and lining due to the gathers. It wasn’t too snug through the middle, but felt thicker than I imagined it should. I ripped it apart and cut the lining from the denier and had a second go. I basted and ripped this apart so many times before I got it right! In the end I cut the lining in half and left the bottom of the bodice unlined. I also lined the back and encased the elastic so it looks nice. I made 1″ FBA on size 14 and that turned out well. I have no idea if FBAs are done on knits normally but it was fun figuring it out and following it through to a great fit. This pattern is a keeper and saved me the trouble of figuring out how to convert a pattern for wovens! I think it would work up in slinky, buttermilk, onionskin or jersey just fine but I would definitely use a lighter weight lining on slinky and perhaps buttermilk. Onionskin would be interesting but I will probably go with rayon/lycra jersey next time around! Lovely top. Thanks for sharing the details of the sewing process. well, i’m glad to see that you had success with that top. I made it, not the halter but the one with the back, out of a chainlink jersey from Georgeous Things, and I just hate how the front panel droops. In order to get it not to droop I’d need to make it too tight, and then it would pull across the front. I didn’t even do a review on it yet. it’s finished and sitting in my sewing room. Have you made the princess top from Christine Jonson? It doesnt’ droop. Hi Leora! I found your blog via Kristine’s quiet little blog. Yes, FBAs are quite normal in a knit, Gigi taught me this trick: a 1″ FBA for a D-cup (was a tick over an inch earlier when I was a size bigger). Above 1″ and it’s hard to ease in the gathers along the side.